1British hose clamps: band thickness isusually about 1 mm, double the thickness of other hose clamps. So the bandtension is very strong. Widely used in larger pressure occasions. With out toothtraces at inner ring of the band can protect the soft surfaceof hoses. 2German hose clamps: the unique sidepressing design, and non-perforated design can effectively prevent the softsurface of the silicone tube and hose from damage. 3.American hoseclamps: with band threadthrough-hole, and teeth of the screw fitted in, they have more powerful locking.and accurate Occlusal. Also,american hose clamps can be used in non-circularobjects, they can bundle the square columnar objects, such as flue, electricvehicle batteries,etc. 4.T bolt hose clamps:similar to theirbrothers ---- the single-head solid strong clamps, both of them belong to thepowerful hose clamps , which also called European clamps. The common bandwidth20MM, 24MM, 26MM,etc., have a larger Strong torque. Widely used in places withstrong fastening force requirements. 5.Vband hose clamps: traditional flangereplacing products. beautiful appearance. cheap. fast and easy installation.high strength, good sealing performance. Pipes are connected with highconcentricity. and easy removal. They can be used as an active connection ofround or oval ducts and pipes which require constant maintenance andactivities. 6.U shape pipeclamps:are used for pipefixing on various surfaces and support structures. U tube clamps is suitable forfixed pipeline with oil, water, gas medium in metallurgy, petroleum, chemicals,vehicles, ships, power hydraulic systems. U pipe clamps under stamping, sheetmetal, galvanized surface treatment , taking shape with "U" style,have a uniqueadvantage of damping, silencers, sound absorption, abrasion etc..
7.Spring-loaded T-bolthose clamps: spiral spring designprevents the occurrence of leakage when temperature changes, and have aself-compensation function (constant pressure). Widely used in truck air intake,cooling ventilation systems. T-spring hoops made of high quality stainless steeland thin band material, provide uniform sealing pressure with special bendingprocess ,forming a completely reliable seal. they are dedicated to theenvironment of vibration and large diameters. 8rubber coated hose clamps: with good flexibility,tensile strength, flame retardant, waterproof, anti-aging, anti-static, hightemperature resistance, corrosion resistance, wear-resistant, anti-UVperformance. 9.Handle/thumb screw hose clamps: simple and easy touse, without any tools. Handle/thumb screw can be plastic coated ornot. 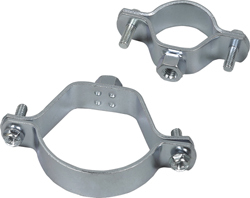 10quick release hose clamps: mainly used in fastconversion, such as sealing of the air duct, dust channel interface. meetsquickly tied needs to enable work very efficient. What is the hose clamp? 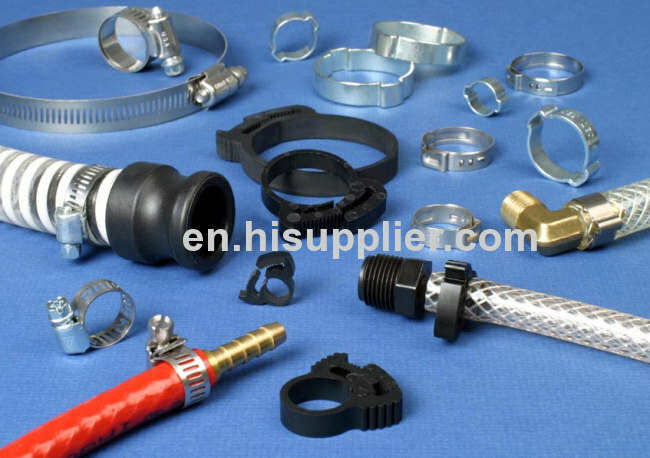 Hose clamp is small, the value is very small, but the hose clamps effect is huge. American-style hose clamps, also known as the band. American stainless steel hose clamps: divided into small American hose clamps and big american-style hose clamps, hose clamps bandwidth of 8, 12.7mm respectively. Through hole process, hose clamps applicability is wide and torsional and pressure, hose clamps torque equilibrium, lock, closely, the adjusting range is big, that applies to more than 30 mm soft hard tube connecting fastener, pleasing appearance after assembly. Features: worm friction force is small, be applicable to the upscale models of senior high school or anti-corrosion materials parts connection. 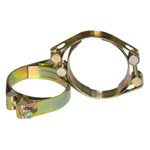 Hose clamps (hose clamp) is widely used in automobiles, tractors, forklifts, locomotives, Marine, mining, petroleum, chemical, pharmaceutical, agriculture, etc all kinds of water, oil, gas, dust, etc., is an ideal connection fasteners. Hose clamps is mainly divided into three kinds of British, American, German type, another bundle oubiao hose clamps, and other derivatives. German type hose clamps: material for galvanized iron on the surface of the buckle from the stamping forming large torsion moderate price is restricted by high production cost higher market penetration.